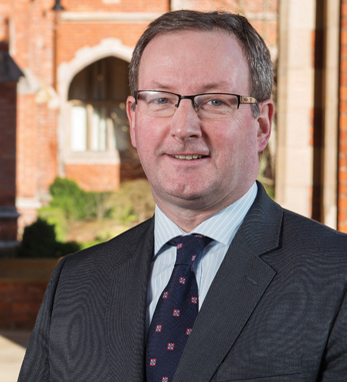 Professor Patrick Johnston is the newly appointed president and vice chancellor of Queen’s University Belfast. Patrick joined Queen’s University in 1996 as a professor of oncology, becoming the director of the Centre for Cancer Research and Cell Biology. He later became dean of the School of Medicine, Dentistry and Biomedical Sciences where he led the foundation of a new international Medical School and Institute of Health Sciences, which is internationally recognized for its excellence in teaching and biomedical research programs. Patrick’s research focus has been on the understanding of mechanisms of drug resistance to therapeutic agents which has resulted in numerous prestigious landmark publications and grants. In 1982, Patrick received a medical degree from University College Dublin followed by a Ph.D. in medicine in 1988. He later obtained a fellowship at the National Cancer Institute at Bethesda. Patrick serves on the Medical Research Council Strategy Board, was appointed Chair of the MRC Translational Research Group in 2012, and is the founder of the Society for Translational Oncology (based in Durham, NC), and Almac Diagnostics (based in the U.S. and Northern Ireland). Among his many awards and honors are the Queen’s Anniversary Prize from Queen Elizabeth II in 2012, a fellowship to the Academy of Medical Sciences, and in 2013 was named winner of the international Bob Pinedo Cancer Care Prize. Patrick and his wife, Dr. Iseult Wilson, have four sons, Seamus, Eoghan, Niall, and Ruairi.